I have to smile a little at someone promoting the value of introversion on Facebook and through TED talks, but that’s just my ironic sense of humor coming out. The one I particularly like on this list is “It’s all right to cross the street to avoid making small talk.” Also – the word of permission to be a pretend extrovert. As the saying goes, I’ve been there and done that. To put it in another way, it’s ironic that there’s really nobody out there talking about the value of extroversion. On the contrary, there are quite a number of people promoting the value of introversion in articles, books, talks, social media, etc. It’s probably because, all this time, the person with the personality and temperament of an extrovert is what’s considered the norm in society. I hate to say it but, more often than not, the introvert is, at the very least, considered strange, or, even worse, dysfunctional and abnormal. 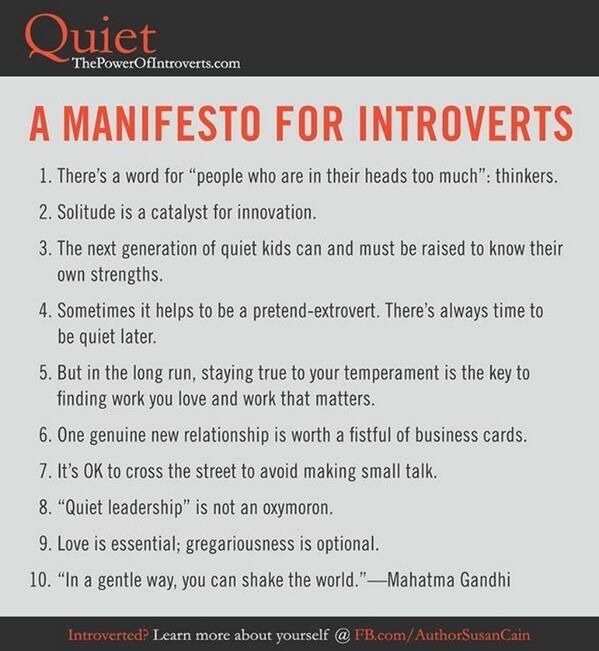 Although the fact is that at least 30% of the population is introvert!